Subsea solution's Hull Cleaning machine. 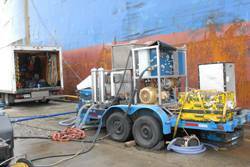 Subsea Solutions Alliance begins Environmentally Friendly Hull Cleaning. The global shipping industry remains stuck between international and regional regulatory requirements and efficient cost effective ship operations. Environmentalists continue to keep ships in the spotlight by focusing their attacks on the air pollution produced by ships. Regional and local port authorities remain focused on keeping their waters free of invasive species and metals like copper, nickel and other harmful chemicals potentially released during routine hull maintenance cleaning and propeller polishing. Considering the fact that more and more local port authorities are closing the door on hull cleaning and propeller polishing, the Subsea Solutions Alliance has been focused on finding methods of performing these critical maintenance items in an environmentally friendly way that keeps our regulatory authorities happy and customer operations efficient. Investing over 2 years of time and resources and almost a million US dollars into the research and development program for an innovative method of Hull Cleaning, the Subsea Solutions Alliance is pleased to announce that our environmentally friendly cleaning machine has been approved for use in the port of Vancouver, Canada. With the port of Vancouver, Canada being closed to hull cleaning for several years now, the Subsea Solutions Alliance could not remain idle, considering the fact that each and every day customer inquiries for this critical service continued to pour in to All-Sea Enterprises LTD, the Subsea Solutions Alliance member company in Vancouver. With many customers making trans-pacific transits once they leave Vancouver, our clients have been very interested to have proper hull maintenance performed in order to save fuel and flat line their operational costs. As such, a method of hull cleaning has been established to capture the spoils produced during the hull cleaning process and properly disposed of through a process approved by the regulatory bodies of Vancouver, Canada. Employed on several vessels already in Vancouver with successful results, the member companies of the Subsea Solutions Alliance look forward to continuing to refine the machine and deploy additional environmentally friendly machines in additional key locations throughout the world. With several key port locations globally currently closed to hull cleaning, the Subsea Solutions Alliance is confident that other port authorities now restricting hull cleaning and propeller polishing will follow the port of Vancouver, Canada with allowing this critical maintenance to take place without any adverse environmental impact. Advanced Hull cleaning equipment designed to properly clean all underwater painted surfaces while encapsulating the spoils released during the process.